Since the cost of the USB connection seems to be the bulk of what makes an Arduino more expensive, what are our options if we want/need USB on board? We’ve previously mentioned the BoArduino from Adafruit Industries (there are two models, one with DC power but no USB, and a USB version.) They just updated the USB BoArduino, and replaced the big USB jack with a mini-USB jack. While this is a kit and needs some assembly and soldering, it’s a very minimal amount. Seeed Studio Depot has two cheap options for you. 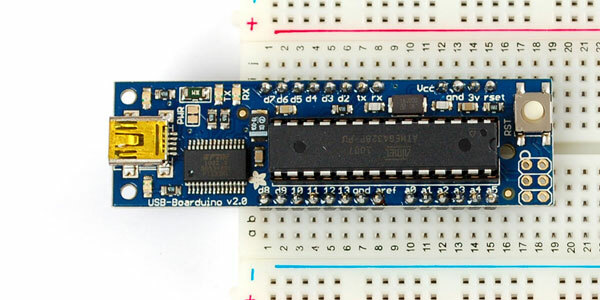 The Seeeduino V2.2 has an ATmega328 for $22.50 + $3.02 shipping. 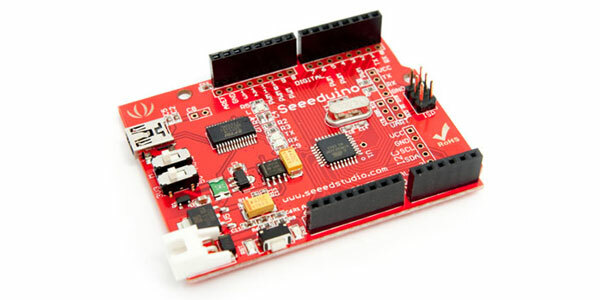 If you don’t need the 328, there is also a Seeeduino V2.2 with an ATmega168 chip for just $19.00 + $3.02 shipping. Both have non-socketed chips, but the boards are the standard size to accept shields. Both of these are not kits, but come fully assembled and ready to use out of the box. Now, a few notes about Seeed Studio Depot. They are based in China (if that matters to you) and the “cheap” shipping option does come with a disclaimer saying “10-30 Days.” There are faster/more expensive options obviously, but we’re going for cheap here, remember? They also offer free shipping world-wide for orders over $50. Unlike most other verndors, they do not seem to offer discounts when you buy in bulk. You want Freeduino? 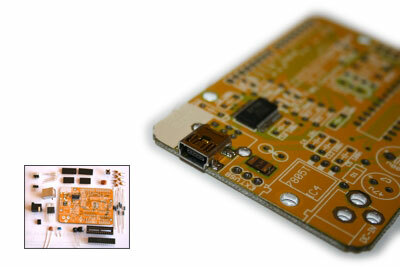 We have a Freeduino option for you… It’s the “Freeduino USB complete KIT” (catchy name!) and like the BoArduino, you will need to assemble/solder it together, though this one will require a bit more work than the BoArduino. Like the Seeeduino, it’s the standard size to accept shields. A nice fit right between the BoArduino and the Seeeduino. NKC Electronics has it for $22.99 + $4.75 shipping. Since we’re talking cheap, our friends at Modern Device have what they are calling “Vintage Italian Arduinos” on sale for $24.95. (It’s actually an older model of the “official” Arduino, the Duemilanove. Not bad for a 100% compatible full-sized real Arduino with USB. Again, if you are just starting out and getting your first Arduino, you really can’t go wrong getting the Arduino Uno, which costs $30 and comes fully assembled and ready to use. In fact, many vendors offer “starter kits” which include breadboards, sensors, jumpers, books, and other “nice to have” things for beginners. For projects where you want a cheap Arduino always connected to a host computer via USB, these options may fit the bill. I’ve ordered one of these for a project, and once it arrives I’ll post a bit more info about it. I also wanted to call out my only “con” for the Freeduino board from NKC Electronics. Vendor/web site does not seem as “big” as others. As noted, this may not be a con. In a future post I’ll talk a bit more about this, and the various places you can get an Arduino from. Until then, keep on hacking!